Guar gum is used as a thickening agent in the manufacture of certain foods, and is similar to xanthan gum which is used for the same purpose. It is also commonly used as a gluten substitute in wheat free and gluten free cooking. When wheat free or gluten free products are made using alternative flours to wheat they require help with elasticity to hold them together, guar gum helps provide this elasticity. 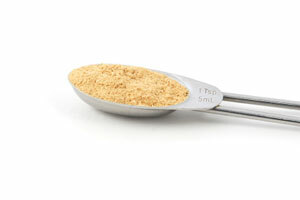 Guar gum can also be used for thickening sauces. Although it is fairly expensive to buy, a little goes a long way, with most recipes not using more than 1-2 teaspoons at a time. Use in any recipes requiring added elasticity to replace the loss of gluten from not using wheat flours. It is especially essential when making wheat/gluten free pastry to avoid it crumbling. Has a shelf life which is generally quite long, and should be stored in a dry, airtight container in a cool area.